As it happens this post means I surpass 300 posts on this blog. Neat-o! OK, so now on to the business at hand. I believe we are up to the third set of templates in our P365 series. 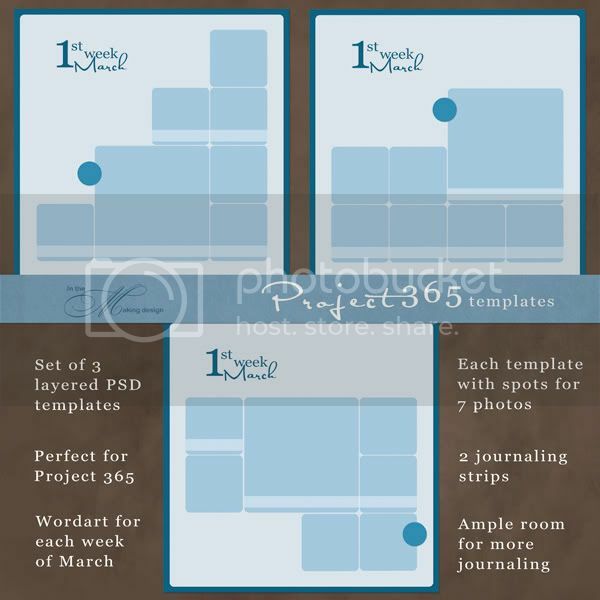 This set coordinates with the two previous ones with the rounded corner squares and the journaling strips. I hope you will like them. You can reach the download link here. Please, as always, read and follow the TOU! Thanks so much! The fourth and last set will be up and posted in a couple of days. I am currently working on finishing the wordart for the rest of the year. The thing that got me was to work out which months have five weeks. Uh, shouldn't be a difficult thing, right? But apparently there are serveral different ways of counting floating around the world. I will possibly solve this problem by making a fifth wordart for all months. LOL, yeah, making it easy on myself. But anyway, if you are interested in the last set check back soon. Ta! Thanks again for another great set of templates. After the next set, I hope you will consider making more sets of templates. They really are a big help. Could you tell me the fonts used for your Word Art? These are awesome templates! Thank you so much for sharing them. I hope to finish a summer album of Mason's golf and really appreciate it! I love these templates. I think they are awesome for P365. I hope you keep going.. Your templates are grat! Thank you! Thank you so much! Your templates are wonderful! Can't wait to use them! Thank you so much for this Freebie. I want to let you know that I posted a link to your blog in CBH Digital Scrapbooking Freebies, under the Page 6 post on Jan. 13, 2010. Thanks again. Great templates! Thanks so much! I just ran across your blog and love the templates! Thanks for sharing your time and talents!